The ear consists of three parts; external, middle and inner. Middle ear includes , ear drum and ossicles. gristle and ear ossicles. Any disease that affects the eardrum or ossicles can lead to conduction hearing loss by preventing sound from being transmitted to the inner ear from the external ear. Such a disease can range from a hole in the eardrum, to the destruction of one or more of the ear ossicles, to the disruption of the ossicular chain. When an inflammation develops in the middle ear, the ear can be perforated and the inflammation can flow out. This hole often heals itself and closes. If it does not improve, hearing loss usually occurs with intermittent or continuous ear flow and tinnitus. You should not get water into your external ear channel. When bathing or washing your head, you should put a piece of cotton coated with vaselin jelly. When swimming, there is a benefit of tightly swimming over the petals with vaselin jelly. In addition, earplugs are sold in various sizes in the market and pharmacies. You should avoid strong burning your nose. This event causes the flora of nose to reach the middle ear by means of the “Eustachian tube” between the nose and the middle ear. The nasal discharge should be drawn in and spit out. If you need to blow your nose so much, it is advisable to do this without closing your other nostril. As long as there is an ear flow, the ear should be apirated as much as possible without getting stuck inside. Drugs should be used if ear infections are present or have started. In the ear path, cotton can be put in order to determine the presence of the current, but this should not always block the front of the flow. Medical TreatmentDrug therapy will often stop the ear flow. Treatment requires intermittent cleaning of the ear, use of drops or dust. Certain people need oral antibiotics. The main purpose of the chronic middle ear surgery was to prevent harmful effects and inflammation for many years. Recently, methods have been developed to regain hearing.Many tissues can be used to patch or reconstruct the eardrum. These tissues are like “the skin of the ear canal, the membrane covering the ear, cartilage”. Damaged middle ear ossicles can be used for restorating ossicular chain to regain hearing. Sometimes, instead of a ossicle, cartilage or prosthesis can be used. The middle ear is a hollow chamber in the bone of the skull. It is separated from the outside world by a thin membrane about half-an-inch in diameter, the eardrum. The middle ear area is lined by the same kind of mucous membrane that lines nose and mouth. It is connected to the back of the nose, just above the soft upper portion of the mouth, by a narrow passage called the eustachian tube. The eustachian tube lies closed until the swallowing movement pulls it open and allows fresh air to enter the middle ear. The fresh air is needed to replace oxygen that has been absorbed by the middle ear lining. The fresh air equalizes the middle ear pressure with the air pressure outside the head. Some people hear this burst of fresh air as a pop or click. Suspended within the middle ear is a chain of three small bones, the ossicles, which conduct sound vibrations from the eardrum across the middle ear into the fluid-filled inner ear. Inside the inner ear these vibrations are converted to nerve signals that are carried by the auditory nerve to the brain. The mastoid bone is an extension of the air space of the middle ear. It is made up of small interconnected air spaces similar to a honeycomb. Its function is not clear, but it is often involved in chronic ear infections. Within it lie the structures of the inner ear responsible for balance and facial expression. What is Chronic Otitis Media? 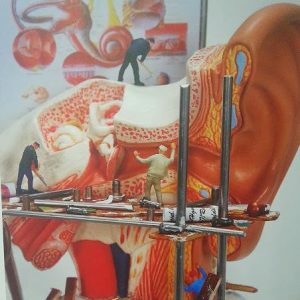 The eustachian tube becomes blocked by swelling or congestion in the nose and throat, by swelling of the mucous membrane in the middle ear, or by swelling of the mucous membrane of the eustachian tube itself, the air pressure in the middle ear cannot equalize properly. A negative pressure develops, and if the obstruction is prolonged, fluid may be drawn into the air space of the middle ear from the mucosa. This may occur with a cold or flu virus and is a common cause of ear infections in children (serous otitis media). Serous otitis media usually resolves without treatment, but may require a course of antibiotics or steroids. It is a common reason for placement of tubes in children and adults. 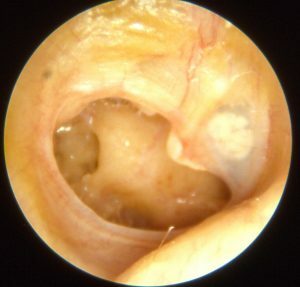 If the eustachian tube blockage persists, chronic changes in the tissue of the middle ear begin to occur. First, the mucous secretions become thicker, and therefore less likely to drain. Then the membranes themselves begin to thicken and become inflamed. The defense mechanisms of the eustachian tube and middle ear become compromised and bacteria normally present in the nose may enter the middle ear and cause a painful condition called acute otitis media. This responds to antibiotic treatment, but may require placement of tubes. The negative pressure in the middle ear or alternating periods of negative, normal and positive pressure may deform the eardrum. In the long term, the eardrum may become severely distorted, thinned, or even perforated. These changes may cause hearing loss and a sensation of pressure. When there is a hole in the eardrum, the natural protection of the middle ear from the environment is lost. Water and bacteria entering the middle ear from the ear canal can cause inflammation and infection. Drainage from the ear is a sign of a perforation. Inflammation and infection in time can cause erosion of the ossicles and the walls of the middle and inner ear. The patient may experience hearing loss, imbalance, or weakness of facial movement on the affected side. In rare instances, the infection may extend deeper into the head, causing meningitis or brain abscess. A cholesteatoma, or skin cyst, is essentially skin in the wrong place. Epidermal skin from the ear canal or outside surface of the eardrum, like that on the back of the hand, does not belong in the middle ear. 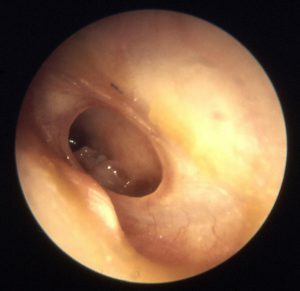 If it is trapped by a deformed eardrum or migrates through a perforation, it tends to grow out of control and can cause significant damage to the structures of the middle ear and mastoid. How Do I Know If I Have Chronic Otitis Media? Chronic otitis media generally occurs gradually over many years in patients with longstanding or frequent ear trouble. However, it can occasionally develop over several months in a patient with no previous history of ear disease. Any of the above symptoms should prompt an evaluation by an ENT or otologist/neurotologist. Tympanoplasty is the repair of the eardrum and/or middle ear bones. Tympanoplasty is most commonly performed for repair of the eardrum. Eardrum perforations (holes) are usually caused by trauma or infection. Two methods are commonly done to repair the eardrum. The first is a Myringoplasty which is used to repair a small hole in the eardrum. In this operation, the hole’s margin is rimmed, a process which removes skin and tissue, and a small piece of fat is placed into the hole. This operation does not take a long time and in adults can be performed in an office setting under local anesthesia. The second operation is a formal Tympaoplasty. In this operation, the middle ear is entered through a canal skin flap and a piece of muscle tendon or fascia is placed beneath the perforation. This operation is usually performed in the operating room and takes much longer under a general anesthesia. Mastoidectomy is a surgical procedure to remove an infected portion of the bone behind the ear when medical treatment is not effective. This surgery is rarely needed today because of the widespread use of antibiotics. Mastoidectomy is performed to remove infected air cells within the mastoid bone caused by mastoiditis, ear infection, or an inflammatory disease of the middle ear (cholesteatoma). The cells are open spaces containing air that are located throughout the mastoid bone. They are connected to a cavity in the upper part of the bone, which is in turn connected to the middle ear. As a result, infections in the middle ear can sometimes spread through the mastoid bone. When antibiotics cannot clear this infection, it may be necessary to remove the infected air cells by surgery. Mastoidectomies are also performed sometimes to repair paralyzed facial nerves. Mastoidectomy is performed less often today because of the widespread use of antibiotics to treat ear infections. • Simple (or closed). The operation is performed through the ear or through a cut (incision) behind the ear. The surgeon opens the mastoid bone and removes the infected air cells. The eardrum is cut (incised) to drain the middle ear. Topical antibiotics are then placed in the ear. • Radical mastoidectomy. The eardrum and most middle ear structures are removed, but the innermost small bone (the stapes) is left behind so that a hearing aid can be used later to offset the hearing loss. • Modified radical mastoidectomy. 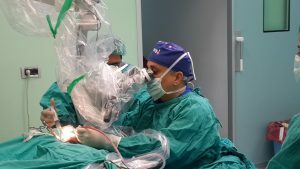 The eardrum and the middle ear structures are saved, which allows for better hearing than is possible after a radical operation. The wound is then stitched up around a drainage tube, which is removed a day or two later. The procedure usually takes between two and three hours. Painkillers are usually needed for the first day or two after the operation. The patient should drink fluids freely. After the stitches are removed, the bulky mastoid dressing can be replaced with a smaller dressing if the ear is still draining. The patient is given antibiotics for several days. • Bright red blood on the dressing. • Stiff neck or disorientation. These may be signs of meningitis. • Facial paralysis, drooping mouth, or problems swallowing. • Infections, including meningitis or brain abscesses. • Facial nerve injury. This is a rare complication. • Temporary loss of taste on the side of the tongue. A rare but chronic inflammatory disease in which skin cells and debris collect in the middle ear, usually as a result of an ear infection. An inflammation of the bone behind the ear (the mastoid bone) caused by an infection spreading from the middle ear to the cavity in the mastoid bone.